In the dark of a full moon night, on a mysterious black ocean, two figures, a guy and his dog are drifting along. How long they've been afloat at sea is a mystery. And then, finally they see something: There's a light source somehwere on the horizon. Is it a lighthouse? It does seem like it, for it's going on and off. Instinctively they decide to swim in its direction. On their way there, they find a bottle with a message inside, reading: "PLEASE LET US COME SAVE YOU". Now what on earth could this mean? CLICK TO VIEW MOVIE NOW! Last edited by MyCreationTV.com; 08-08-2011 at 06:48 AM. I watched all one minute of it. I appreciate that some folk's attention span is short; but why is it so short? I did not click on the option to see part 2 because it might lead to an unknown number of installments. Had you considered editing all the episodes together? I liked the look of the scene in the boat and the audio was nice and clear. Interesting. I want to know what happens next. I suppose, if you get something for each visit to the page you could spread the video out for ages. lol, thanks folks for watching! 1. My idea to have drawn a daily comic strip, meant to be read every day. Except instead of a comic strip it evolved into a short motion picture for every day. 2. My internet. It's slow and very expensive. I live where I can't have ADSL lines and barely any cellphone signal. So I got this radio/radar internet that is very, very, very expensive and I only have 1Gig every month. So, I can only upload short videos spread over a long time, about four to six every month. I hope inexpensive consumer satellite internet is not far away. Furthermore it's easier to handle "filmmaking" in short bytes. Otherwise I probably will never finish anything for I lose interest if I work on something too long. But look, don't be scared like Tim to just click "NEXT" underneath the video. Watch until you are satisfied for the day. Watch one a day. Watch more. I won't penalize you either way. In the dark of night on a strange dark sea, our two friends are still drifting along when they discover a bottle with a message inside. The message reads "PLEASE LET US COME SAVE YOU". Ah, just what they need... sort of. They need someone to come save them, but now they'll have to send a message back to let them know they're here... something's not quite going to work. The lighthouse is closer now, but now Kevin can see it's no lighthouse at all - it's the Kronobot! Comeon Kevin, think! Why are you here and how did you get here? He suddenly bumps into a wall. Ah, neat swimming pool steps leading to a little gate. Yep, here's a place to get out of the water. Danger's over! Kevin let's Majoor jump off his back, but what is Majoor doing now? He's swimming on back into the darkness. Why isn't he coming out with Kevin? 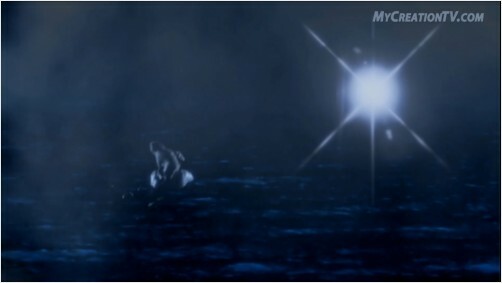 Kevin calls him but Majoor disappears into the darkness of the water.